Saint Gregory of Tours (30 November c. 538 – 17 November 594) was a Gallo-Roman historian and Bishop of Tours, which made him a leading prelate of Gaul. He was born Georgius Florentius, later adding the name Gregorius in honour of his maternal great-grandfather. He is the main contemporary source for Merovingian history. His most notable work was his Decem Libri Historiarum or Ten Books of Histories, better known as the Historia Francorum ("History of the Franks"), a title given to it by later chroniclers, but he is also known for his accounts of the miracles of saints, especially four books of the miracles of Martin of Tours. St Martin's tomb was a major draw in the 6th century, and Gregory's writings had the practical aspect of promoting this highly organized devotion. 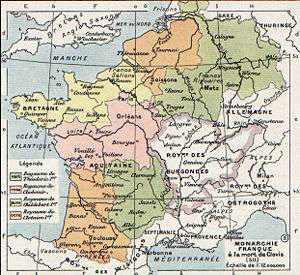 The Historia Francorum is of salient historical interest since it describes a period of transition from Roman to Medieval, and the establishment of the Frankish state, the area of which, despite numerous fluctuations, was to remain large in terms of population and territory, and fortunate in terms of resources and wealth, throughout the Medieval period, despite divisions that formed as the modern map of Europe evolved. Gregory's hagiographies are also an invaluable source of anecdotes and stories which enrich our understanding of life and belief in Merovingian Gaul. The motivation behind his works was to show readers the importance and strength of Christianity. His extensive literary output is itself a testimony to the preservation of learning and to the lingering continuity of Gallo-Roman civic culture through the early Middle Ages. ↑ Jones, Terry. 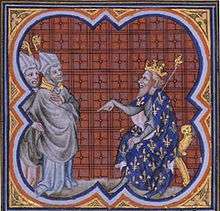 "Gregory of Tours". Patron Saints Index. Retrieved 2007-01-16. ↑ Sandys, John Edwin. History of Classical Scholarship, Vol I. 434-435. Cambridge: CUP, 1903. ↑ Thorpe, Lewis (1974). The History of the Franks. London: Penguin Books. p. 30. ISBN 978-0-14-044295-3. ↑ Gregory of Tours, The History of the Franks. Harmondsworth: Penguin, 1974, p. 63. Diem, Albrecht, ‘Gregory’s Chess Board: Monastic Conflict and Competition in Early Medieval Gaul’, in: Philippe Depreux, François Bougard, and Régine Le Jan (eds. ), Compétition et sacré au haut Moyen Âge : entre médiation et exclusion, Turnhout: Brepols 2015, pp. 165-191.